Proterra is an American private bus manufacturing company. It is working on electric buses since 2004. The Proterra electric bus company was founded by Dale Hill with an aim to reduce emission problems and focus on clean energy. Currently, Tesla is working on the electric car ecosystem making it more reliable and affordable. On a similar basis, Proterra is designing the battery technology for heavy-duty electric mass transportation. Proterra started with its first bus model EcoRide BE35. It is a 35ft long bus with fast-charging technology. On an average, the bus delivers a combined fuel economy of 1.12 Kwh/km. 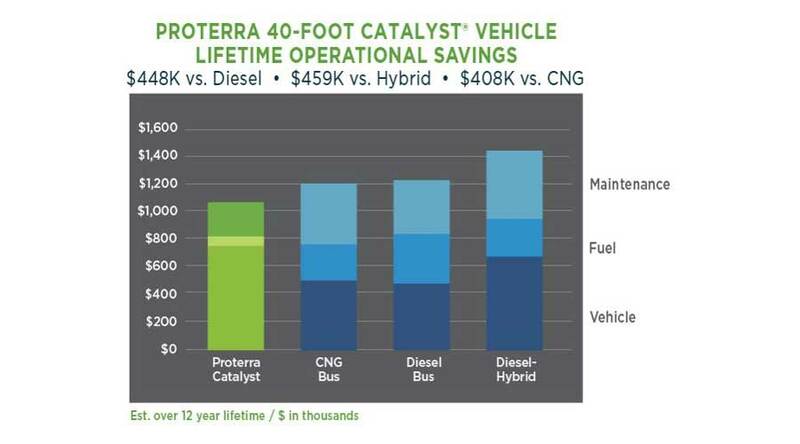 In 2014, Proterra introduced the Catalyst which replaces EcoRide BE35. Proterra Catalyst, the second generation bus, is almost 40ft long. The extraordinary feature of this bus is an en-route fast charging. Hence, it can be operated 24x7. The lengthy wait at the charging station can also be avoided. In addition, there are no engine vibrations. The bus does not make any noise. It runs virtually silently. The carbon footprint of the bus is very negligible. These buses have zero tailpipe emission. The Proterra’s catalyst bus is made of a composite body structure. So, it has very less Kerb weight, improving its efficiency. The modular battery storage enhances its capability further. The powerful drive train makes these buses quicker. It can go from 0-60 in 6.8 seconds. In one charge, the bus can cover 563km. The bus is very efficient while climbing a hill. It can easily climb steep hills with a gradient of 15.5%. The composite body is very strong and can resist impact. The body also anti-corrosive. So, it increases the lifespan as compared to traditional diesel buses. The emission problems are on the rise. Many urban cities are really filled with poisonous gases these days. Proterra bus produces zero emissions when compared to a diesel bus. An electric bus will reduce the annual emission of 243980 lbs of CO2 per diesel bus. The traditional diesel bus goes up to 1.64 km/ liter while the electric bus can cover 9 km/ liter when we compare fuel vs electricity costs. Thus, the electric bus gives big savings to transport operators. The consumers also get the benefit as the fares are low. This is a win-win situation for both - the operators and consumers. In addition, the maintenance cost of electric buses is lower. The overall parts in electric buses are less. So, it reduces the operating cost. The average operating cost of the electric bus is just 19 Cents/per mile while that of diesel bus is 84 Cents/mile. 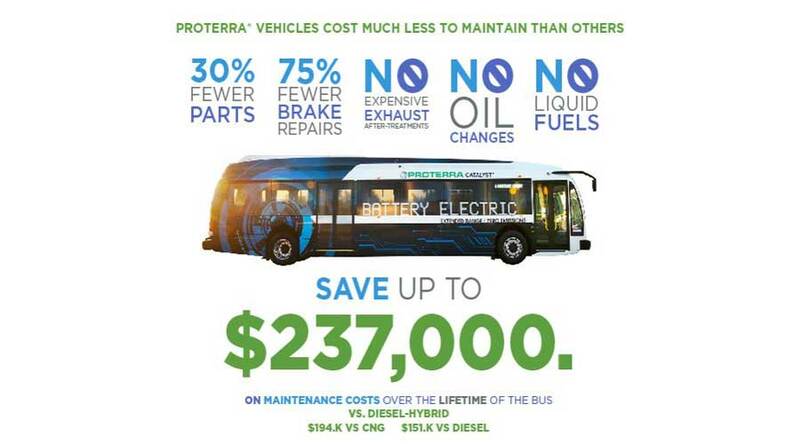 The Proterra Catalyst bus has 30% fewer parts compared to hybrid and diesel buses. The bus employs the regenerative braking system. It has air disc brakes both at front and rear. The transport operator can save a lot on maintenance. In conclusion, Proterra buses stand out when it comes to emission-free travel along with lower maintenance and higher efficiency. So, it has the lowest cost of ownership with lots of other benefits.